A: For acrylic charms, no. We require the cutline have at least a 20 pixel (Approximately 0.05") offset from your design. The reason for this requirement is because our charms are directly printed on acrylic and laser cut into the shape that you designed. As a result, the melting acrylic can potentially warp and/or weaken the printed area. So if you send us a file with a cutline of less than 20 pixels we will let you know and ask you to fix the file. For wood charms, there is no minimum for the cutline. However, you will have to provide at least 16 pixels (Approximately 0.04") for bleed in your design. Q: Can I make the cutline bigger than 20 pixels? A: Yes! You can modify the cutlines to anything you want as long as you retain at least 20 pixels border to the print area and keep it within the canvas size. Q: Can I leave cuts within my charm so that there are holes in my charm besides the initial cuthole I assigned from the template? A: Yes! As long as the cutline within the charm has at least a 20 pixel border with the printed image. Also, you have to consider the shape of what you are cutting out and that the acrylic is being cut out by a laser so it will melt and not produce a clean cut if you are trying to cut out tiny strips (basically anything less than 20 pixels). In general, if you want to cut little parts out of the charm it does not look very good, but you can definitely incorporate larger holes that compliment your design and create really cool effects. For example, if you make a donut charm you can cut out the donut hole in the middle as long as the hole is bigger than 20 pixels AND the cut is 20 pixels away from the printed donut. So the end product would be a printed donut on a donut shaped acrylic. Q: Can I change the size of the provided cuthole in the template? A: You can expand the dashed line so that the cuthole will be deeper in the charm, but keep in mind that you will have to thread the charm so depending on the ring you plan on using it might be extremely difficult or impossible to thread. You cannot shrink the dashed line since it will make the cuthole too thin making the charm prone to shattering. Do not change the solid circle. Q: Can I have multiple cutholes? A: Yes, you can have a maximum of 2 cutholes. Just duplicate the cuthole layer provided in the template and place the two cutholes where you want it to be. If you want more than two cutholes, there is an additional fee and you will need to contact us. Q: What is charm translucency? A: The translucent effect can only work on clear acrylic charms if you leave out the white portion so that light passes through. The effect is similar to a stained glass look and works since the color inks are not completely opaque. However, in general darker, more saturated colors will come out looking better for this effect. For example, light yellow will barely show up while a darker, saturated blue can be clearly seen. Q: So as long as I leave the white layer blank for a portion of my design, that part will come out translucent? A: For every color EXCEPT white, yes. Since printing white is entirely dependent on filling in the white layer, if you leave white in any translucent effect it will come out transparent instead. Q: So is it possible to have translucent white? A: Yes, but you have to fill in that specific portion of white you want to be translucent with a lower opacity black in the white layer. Please let us know that this is an intended effect when you submit your order. 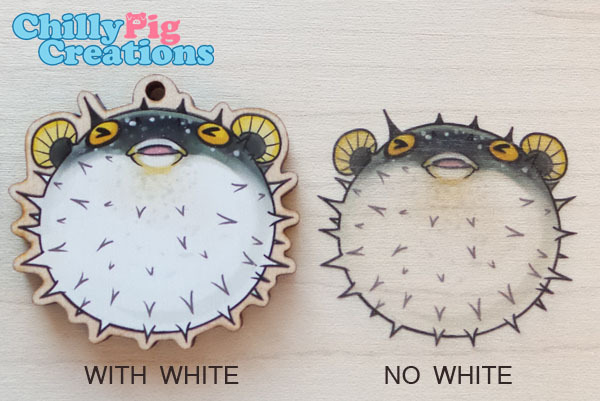 Q: How does it look like for wood charms with white and without? A: Here's a photo for you to compare wood charms printed with white and without. Q: When should I get the extra white upgrade? A: The extra white upgrade is only for clear acrylic charms. In general you would always want extra white if your front and back images are different. The reason is that the white ink is not 100% opaque and the color ink is translucent. As a result, a thick white layer in the middle of the front and back side acts as a divider minimizing how much you can see the back side of the charm from the front and vice versa. However, even when the images are the same, you might consider using extra white if you want to minimize color variations. The issue is that with one layer of white, more light can pass through the charm so the colors seem more saturated since you can see through more to the identical back side from the front thus adding extra color to the same spots producing a darker effect. This issue will also produce greater inconsistancies between prints (i.e. printing the same image today then a month from now) since it will amplify any differences in printing caused by the environment (temperature, humidity, etc) and the amount of white ink left in the printer (which affects the opacity of the white ink). Unfortunately, these variations are part of the limitations of printing, but they can be mostly mitigated with the extra white upgrade. That being said, the color inconsistencies are not very apparent. Practically, you can only tell if you closely analyze the charms side by side or if you have stared at the original image for hours on end (i.e. the artist). Q: Whats the difference between Matte Gloss and High Gloss? A: Matte Gloss has a shimmering look with a slightly textured feeling which is resistant to fingerprints. High Gloss has a thicker coating that gives a smoother, shiny look. Q: Can I see pictures of the different upgrades? Q: Is there tax on my order? A: Only for our clients based in California. Unfortunately, we are required to collect sales tax for California based clients. Once you have verified that you qualify and filled out a form, email us a copy of your completed form and we can invoice you without the sales tax. Do not just order from the store if you plan on using your resale certificate! Q: What kind of shipping do you use? A: We ship with USPS priority mail. For deliveries within the USA, it takes approximately 2-3 days. For international deliveries, it takes approximately 6-10 days. A: $10 flat rate within the USA. For International orders, it depends on the location and size of the order. You can see the price during checkout. Q:Can you get the order to me before my convention on this date? Please do not hesitate to contact us about our rush availabilty and actual timeline so we can work something out together! Q: Can I print clear acrylic charms larger than 2" or white acrylic charms larger than 1.5"? A: You will have to contact us to see if we have enough stock to fill the order at the time. Also, please note that any special order charms are only available with Matte Gloss.